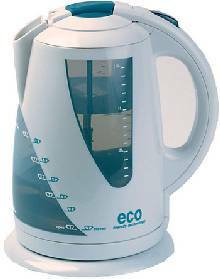 If you enjoy a nice cup of tea or coffee, but you want to save electricity then look no further than a new eco kettle. The term eco kettle covers a wide range of products which heat water efficiently, only heat the amount of water that you need, and keep boiled water hot for longer. Why Use an Eco Kettle? 1) Making it easier to view the level of water in the kettle. If you need to boil enough water for two cups of tea, then the kettle can have markings on it so you can confirm that there are two cups of water in it. If you only boil as much water as you need then you can save a lot of electricity. According to the Department for Environment, Transport and the Regions (DETR) a family could run a TV set for 26 hours or light a house for a day on the electricity wasted by boiling more water than they need for one week. The Department of Environment, Food, and Rural Affairs (DEFRA) have calculated that if everyone in the UK only boiled the water they need rather than filling the kettle the UK would save 1.27 Billion kWh of electricity (and hundreds of millions of pounds). 2) Keep water hot for longer. If you boil too much water then having a well insulated kettle will mean less energy will be needed later on when you need more hot water. 3) Fitting a temperature gauge. If you knew that the water inside the kettle was still hot enough to make your drink, you would not re-boil the kettle wasting electricity. There are now a range of environmentally friendly kettles on the market which have one, two or all of these energy efficiency features, and although they are a bit more expensive to purchase starting at at least £30, over the typical five-year life of the kettle it will more than pay for itself in saved power. Pictured above is a 3kW Eco Kettle designed to boil from 1 to 8 cups of water (1.5 litres) at a time. The kettle can be filled to the brim, but only the number of cups of water you require (selected by pressing a button in the lid) are released into the boiling chamber and boiled. A washable limescale filter is included, together with steam control and boil-dry protection. 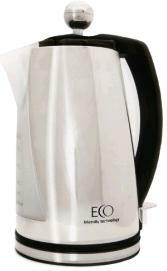 Click here for more information and to buy the Eco-Kettle for £29.50. No matter what kind of kettle you have, you can increase its efficiency simply by ensuring it is kept lime-scale free. If you live in a hard water area lime-scale can quickly build up on the kettle’s heating element increasing the length of time and energy it takes to boil water. Leave the kettle filled up to the height of the heating element in dilute vinegar overnight, wash it out well in the morning, and you will have a more efficient kettle.